Cami Anderson, the Christie-appointed Newark schools superintendent, apparently will pay no price for sending out a letter to Newark families contending that, when their children are home from school, they get into trouble, crime goes up, and the city is ”less safe.” She will not lose her $240,000-a-year job or her $50,000 bonus, she will not have to apologize, and she won’t even have to admit she sent out the letter. Teachers, however, who have made less inflammatory comments have paid with their tenured jobs. Anderson made the comments in a letter she emailed to schools Nov. 12 with instructions that it be copied and distributed to children to take home. It was mostly a rant against the Newark Teachers Union for supporting teachers who opted to attend the annual convention of the New Jersey Education Association (NJEA) convention in Atlantic City Nov. 7 and 8. Although law requires districts to permit teachers, without penalty, to attend the convention, Anderson had produced a calendar that indicated the schools were open Nov. 7 and 8. On Nov. 6, when it became apparent more than 1,000 of the city’s teachers would not be in school, she canceled classes for students and ordered hastily arranged in-service sessions for teachers not going to Atlantic City. In the past, she wrote, when schools were closed for the NJEA convention, “with too many young people idle, crime went up.” Closing for two days, she wrote, hurt the schools, “making our city less safe.” The Newark Public Schools administration and the Newark Police Department could not provide evidence to back up these assertions. Statistics from the US Justice Department show the opposite to be true–most juvenile crime occurs on school days, in the hours after dismissal and in he absence of after-school programs. As they say, read the whole thing. Braun goes on to make an excellent comparison to a teacher in Paterson who was slammed for saying pretty much the same thing in a Facebook post. Not that I excuse that teacher: she was wrong, but so is Anderson. However, as Braun points out, no one in power appears to have a problem with the state superintendent calling Newark's students criminals (the Star-Ledger, as usual, is too busy painting Newark's teachers as evil - because they want a place to park their cars - to pay any attention to Anderson's slight). There so much to unpack here. Start with the fact that, once again, teachers unions are always wrong and evil and destroying America. How dare these Newark teachers go to the convention, the state's largest professional development opportunity and a place State Education Commissioner Chris Cerf himself says is a great event! Even when it's written in law that they can attend! How is it possible that the superintendent of New Jersey's largest school district doesn't know the basics of NJ education law? And the lame excuse that this cuts down on school time is beyond stupid: the number of days required for the school year is also set by statute (and dictated by funds). If you keep school open for two days during November, you'll just close it earlier in June. Let's also take a moment to acknowledge Anderson's refusal to own up to making this huge gaffe. At the very least, she should have sent a follow-up letter to the parents who received the first one, apologizing for her implications. Luckily for Anderson's ego, being reformy means never having to say you're sorry (or, at least, say you're sorry like you mean it; yes, Arne, I'll get to you next...). But here's my biggest takeaway from this incident: when unqualified people run school districts, stupid happens. I've never quite been able to figure out the timeline of Cami Anderson's early career. Joy Resmovits, who usually gets this stuff right, claims Anderson spent ten years teaching. But there's no way that's correct: Anderson graduated from Cal-Berkeley in 1993 and then entered Teach For America. It appears she - like so many other TFAers - did her mandatory two years and immediately got out of teaching, enrolling in a masters program at Harvard in 1995. From there, it was straight over to a job at TFA and away from the public schools. You'll forgive me if I don't find a stamp of approval from a snake-oil salesman like Klein to be particularly encouraging. In any case, I'll be the first to say that Anderson was doing important work in NYC and should be lauded for her efforts - but work experience like this is of limited value when it comes to preparing leaders to run entire school districts. Did Anderson ever have to deal with the daily issues and challenges faced by superintendents who run bread-and-butter school districts? Is running such a specialized "district" within the huge bureaucracy of the NYC schools really the only experience someone like Anderson needs to run a district like Newark? At most, Cami Anderson had two years experience as a full-time, school-level educator, and seven years in any capacity as a public school employee before taking over New Jersey's largest district. She had never been an experienced teacher, never been a principal, and never held a district-wide central office position. Newark is being sold a lie, and they've had enough. The elected school advisory board has had enough. The elected city council has had enough. The students have had enough. The teachers have had enough. The parents have had enough. Everyone in Newark is rightly sick and tired of the empty promises of state control under Chris Christie, Chris Cerf, and - to be fair - their predecessors. An ELC analysis of NPS building conditions shows that the Ironbound schools are among the most neglected, overcrowded and dilapidated in the city. Oliver Street is ranked as the second worst school facility in Newark. Wilson ECC ranks 4th, Lafayette Street Annex 6th, and South Street 11th. I can't think of what's more disgusting: Anderson implying Newark's students are criminals, or the way the state treats them as such. I won't pretend for a second that if Cami Anderson were a well-qualified, experienced New Jersey school leader with roots in this state and a complete, traditional certification, the problems of Newark's schools would be wiped away. I'm only saying that if she were, we would most likely be focusing on the real problems Newarks' schools face, and not reading stupidly racist, dog-whistling language coming out of the NPS central office that blames teachers conventions for increases in crime. "Hey, I'm just saying what the boss behind me is thinking..."
We need to keep up the pressure on Cerf and his minions like Anderson. Neither of them are qualified for their positions. And why hasn't anyone called out Cory Booker for not speaking up about this? His lack of response is telling. http://teacherbiz.wordpress.com/2013/11/16/cami-anderson-njea-convention-drives-newark-children-to-crime/. Bringing up the NJEA convention as if it were something horrible, is just misdirection, pettifogging and demagogy. 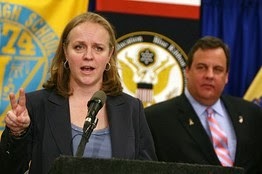 Christie and Anderson will stoop to any dirty depth of duplicity to smear, swift boat or libel the NJEA. Here's a quickie review of a Henry Giroux book that sums things up nicely: "Education and the Crisis of Public Values examines American society's shift away from democratic public values, the ensuing move toward a market-driven mode of education, and the last decade's growing social disinvestment in youth. The book discusses the number of ways that the ideal of public education as a democratic public sphere has been under siege, including full-fledged attacks by corporate interests on public school teachers, schools of education, and teacher unions. It also reveals how a business culture cloaked in the guise of generosity and reform has supported a charter school movement that aims to dismantle public schools in favor of a corporate-friendly privatized system. The book encourages educators to become public intellectuals, willing to engage in creating a formative culture of learning that can nurture the ability to defend public and higher education as a general good - one crucial to sustaining a critical citizenry and a democratic society." Giroux has appeared on the most recent Bill Moyers show. In addition to the racist statements, if Cami is so concerned about students missing school, why did she fire all the attendance counselors? The REAL Christie Legacy: "We Deserve Better!" Union-Hating Steve Perry Is Coming To Rutgers! Teacher Christie Bullied on Ed Show Tonight!